The respiratory care is a medical specialty that is well-organized and specialized. Under the guidance or supervision of physicians, respiratory therapists evaluate, treat, and care for patients with breathing or other cardiopulmonary disorders. In recent years, along with entering into elderly society and producing more and more environmental pollution, people in Taiwan pay more attention to the respiratory therapy and know that the respiratory therapist is seriously insufficient. Consequently, the Department of Respiratory Care at Kaohsiung Medical University was established on August 1, 2002 and offered Bachelor Degree of a 2-year (on-the-job) program to students who already had Associate Degree. It is the first faculty of respiratory therapy in Southern Taiwan. Later on, the Department of Respiratory Care offered Bachelor Degree to undergraduates on August 1, 2004. In order to meet the recognition of the public and be in conformity with the license of national respiratory therapist exam, we changed its name to “Department of Respiratory Therapy” on August 1, 2008. 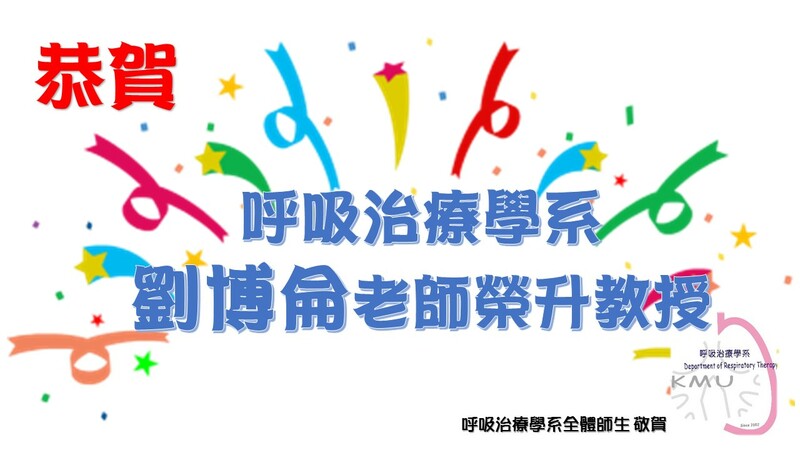 Besides cultivating the talented people and raising the quality of medical treatments, we systemize and professionalize the education and training of respiratory care, wishing to hold a key position in the field of respiratory care in Southern Taiwan. The department cultivates high-level professionals who have humanity concerns and specialized skills in the field of respiratory therapy. The department positively cultivates the talents of humanities cultivation, international perspectives, social caring, independent thinking, and lifelong learning. Furthermore, we improve the quality of respiratory care to enhance the living standards of the patients and conduct more research related to respiratory therapy in medical science field. The Department of Respiratory Therapy is the first faculty of respiratory therapy in Southern Taiwan. We offer degrees of the undergraduate program and 2-year (on-the-job) program. The cooperation with the Kaohsiung Medical University Chung-Ho Memorial Hospital and other institutions provides the best practical environment and opportunities to promote professional techniques. The curriculum design emphasizes on both general education and specialized courses, integrating fundamental and clinical courses, applying innovative teaching methodologies (EBM, PBL, OSCE…, etc.). We provide rewards for collaboration between students and instructors to engage in basic and clinical studies in connection with respiratory therapy, promoting presenting research results in international symposiums in the related fields. We take advantage of the Clinical Technical Center and professional classrooms to propagate electronic simulated teaching leading to the proficiency of clinical specialized techniques. a respiratory therapist in RCW, an administrative staff in RCC, etc. a technician in Pulmonary Function Room, Polysomnography Room, Bronchoscope Inspection Room, etc. respiratory care, pulmonary rehabilitation, etc. Graduate Institute of Medicine, Biomedical Engineer, Physiology, Medicine Management, Biotechnology, and so on. graduate institute, healthy education of high school, biology teacher, etc.